Let me first start with an introduction on “Cognitive Computing”. Cognitive computing are systems that are designed to make computer’s think and learn like human brain.Similar to an evolution of a human mind from new born to child to an adult, where new information is learned and existing information augmented, cognitive system’s learn through the vast amount of information fed to it and training on a set of information,so it can understand the context and help in making informed decisions. For example, if you look at any learning methodology, a human mind learns and understand the context, but its equipped to answer questions in an examination/interview which it might not have seen before, but using the experiences and past learning,a informed judgement can be made. Similarly cognitive systems are modelled to learn from past set of reference data set (or learning) to help users make informed decisions. Cognitive systems can be thought of non programming systems which learns through the set of information, training, interactions and a reference data set. So where does Internet of Things fits into the cognitive world. I assume you are aware of IoT, if not, please read my introductory blog at – IOT – Are you connected? 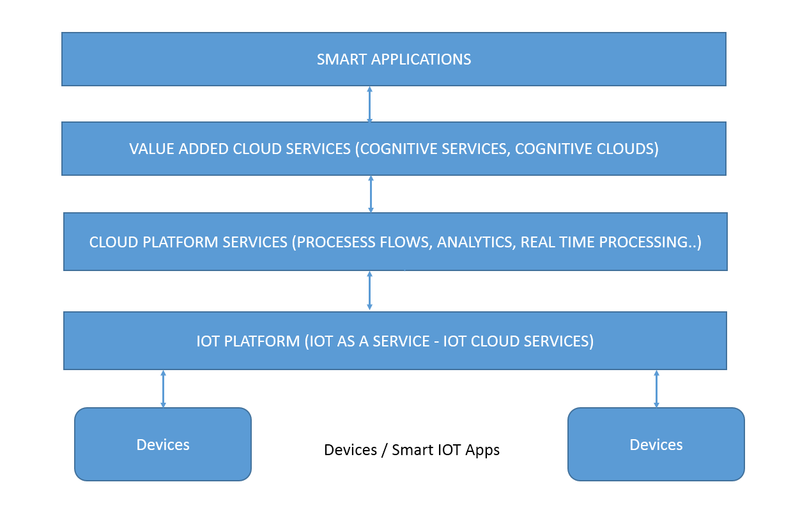 Let’s start with high level view of an IoT Cognitive Systems Architecture. The real value of IOT applications is realized by enabling them as part of existing applications and higher value added services to create new innovative business solutions. IoT is not just limited to devices and sensors, but how do you derive real insights from the sensor data, filter and analyze the data and use the information with multiple data sources, understand and infer relationship in context of the use case to augment current application with new offerings or build new innovate solutions. The architecture talks about the evolution of an application, building on the value chain and how various cloud services and offering are used to enable smarter applications. Let’s take an example of a cognitive IoT application. I have taken a very simple example to get the technology and benefits across. As you see in the above example, the real value is derived from how data from sensors are used as part of the broader ecosystem and how cognitive capabilities and learning are used to provide value added services. These are just one of the many experiences. The real experiences would be technology touching our every day lives and making it easier and a better place to live. I gave a consumer driven example, but IoT benefits can be leveraged across industries – connected cars, aviation, manufacturing, predictive maintenance, healthcare, insurance etc..
With the context set, I suggest to read my follow on blog on “Architecture of a Connected World“.